Freedom of information often known as FOI is currently a commonly used method of finding out aspects of your local councils business. We as council tax payers have a right to know what our taxes are being spent on. 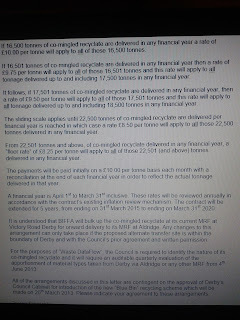 It was with this in mind having noted recently that Derby City Council was facing charges from its recycler Biffa for contamination (which previously was not the case) that I set about requesting a copy of the contracts linked to the blue bin recycling scheme which I thought was a simple thing to do and expected few problems. 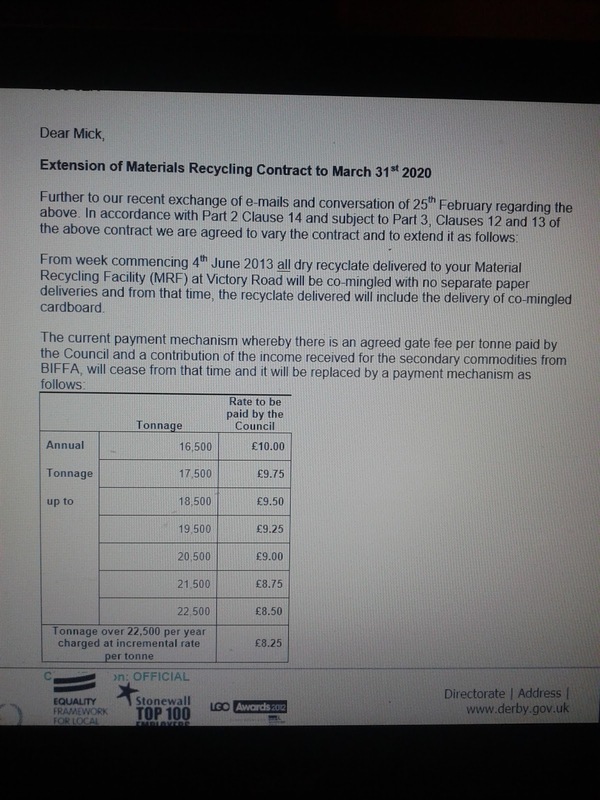 a copy of all current contracts relating to the blue bin material collected and its onward treatment - ie BIFFA etc. The council had 20 working days to provide the requested information and I sat back and waited. 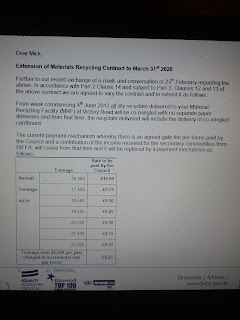 This is when the council started to play hard to get because on day 18 they decided they didn't know which contract I wanted and asked me to clarify this for them - I concluded this was a delaying tactic and so lodged a formal complaint - and clarified which contract I was interested in when responding to the councils FOI dept. "In accordance with the Environmental Information Regulations 2004 - Regulation 7, Question 1 due to the volume and complexity of the request , we will need to extend the period to respond from 20 to 40 working days. The revised deadline for our response is 21 October 2015." So they had managed to stretch their response time to 40 days! what were they trying to hide! Finally they gave their response - and it wasn't good news ! they partly declined to answer my requests siting commercial interests. "Your request has now been considered and part of the information you have requested in Question 1 is covered by an exemption under Freedom of Information. We have attached part of the information however, in accordance with the Freedom of Information Act 2000 this part of the email acts as a part Refusal Notice. We have applied this exemption because detailed costs cannot be disclosed as this would prejudice the commercial interests of both the Council and third parties. Disclosure of this information would compromise future tenders and the cost of providing this service in the future could increase, as a result. Also, third parties could be commercially disadvantaged if their detailed pricing information was in the public domain. On balance we feel that the potential prejudice to the commercial interests of the Council and the other parties in disclosing this information outweighs the public interest in making it available in the public domain. It is therefore, not considered in the public interest to release this information because the cost of providing this service could increase in the future which could affect public services provided by the Council." Now what struck me straight away was that this was a contract processing my rubbish using my money and I had a right to the facts. I already view the councils accounts so would know many of the facts they were looking to withhold. So what did they do? well they issued a few documents relating to the processing of recyclables but then redacted large parts of the most recent correspondence between the council and Biffa - as shown below. 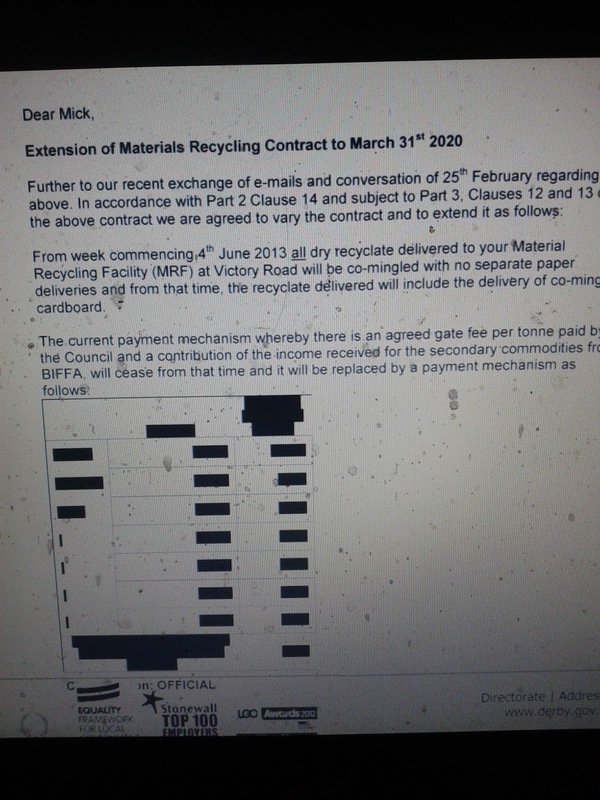 As you can see not only did they redact figures in the letter - which incidentally was relating to the contracts extension but also redacted whole paragraphs - so it wasn't possible to even work out what was being redacted. 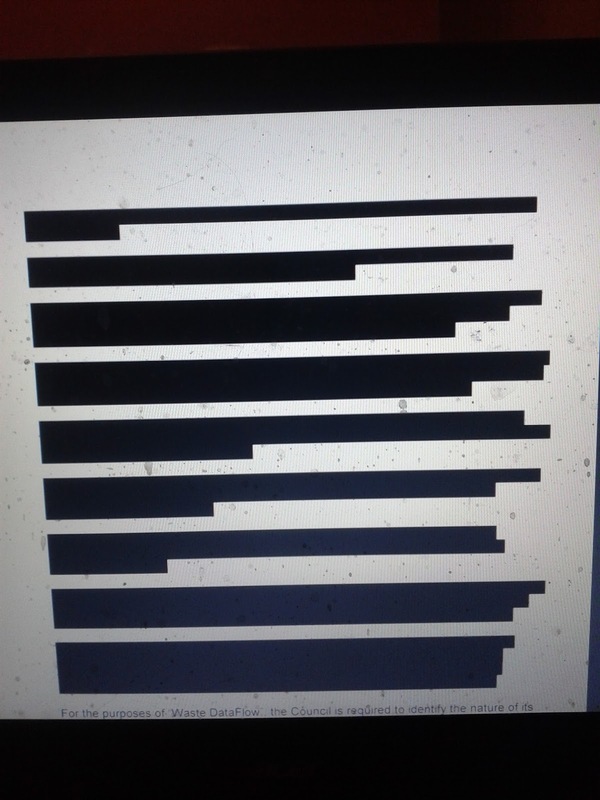 These things are sent to try us but it is our right to know so there was only one thing to do - make an appeal to the council about the redaction. 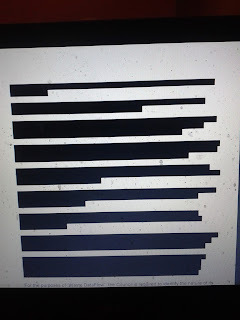 If you make an FOI on a subject don't just accept the first result - they don't want to tell you their secrets so will try and fudge you with a redaction so set out why you should be issued a full copy of what you have asked for. In my case in the end I was successful when the Principal Information Governance Officer at Derby City Council found in my favour. So what were they trying to hide? nothing more it would appear than the fact the more recycling that goes into the blue bin the less the council - and so us as residents pay via our taxes! 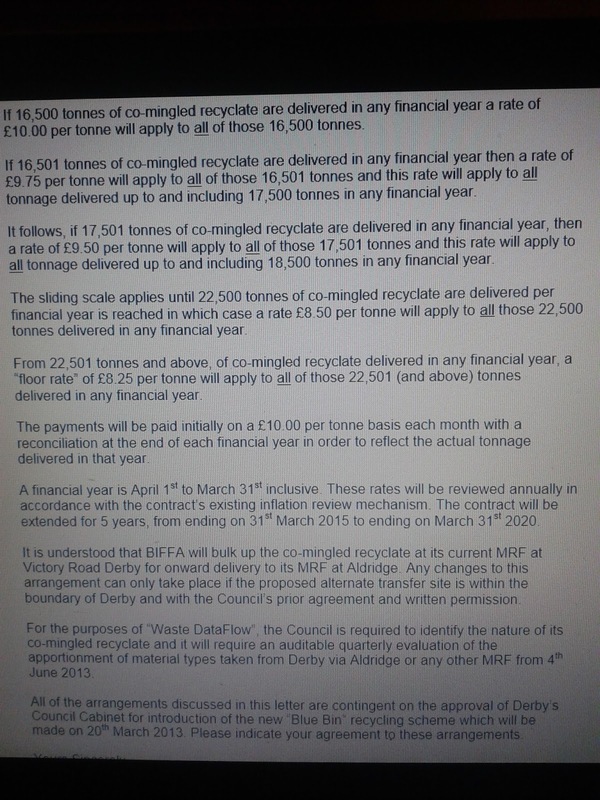 You would think this would be exactly what the council SHOULD be promoting to its residents - to inspire residents to recycle more but instead it hides the facts from the public by redacting aspects of the contract! I'm often to running a blog and i really respect your content. The article has actually peaks my interest. I'm going to bookmark your website and preserve checking for new information.